After reading this, I was exhausted by the sheer quantity of specifics in chapters 1-5. There is more science here than need be (and I like science.) I don't really want to read about a scientific study to validate every other statement. Some of the study outcomes reflect country, race, age, gender, so who knows if the results can be extrapolated to the reader. Studies do not make me trust or believe a program more, because one can set up a study to prove just about anything and the sheer quantity of defense obfuscates whatever the doctor is trying to say. It makes being able to just read this book practically a painful experience. However, there are a number of tests, questionnaires, and do-it-yourself directions to dull even a Cosmo girl's pencil. If you can get past over-researched explanations why every little thing does what it does, you will find this: Boucher emphasizes high interval training, especially interval sprinting (great advice for someone with my knees.) He waxes on about the relationship between lifestyle changes, and healthy living to affect body composition. After five chapters of going on, chapter six a provides a six week plan. I found the book dry, not very readable and with no big surprises. Diets always come down to exercising more, and eating better, right? In those contexts, Boucher is very specific about what 'more' and 'better' mean. Note that my rating is more about readability than diet performance. I don't see myself taking Boucher on as a guru. 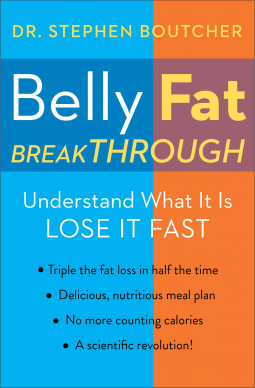 To be completely fair, the true test of this book would be in following his plan and then referring to diet success to gauge the book's success.